Serves4. Preparation 10 minutes, plus time In marinate. Cooking time 10-45 minutes. You can use brandy instead of tequila but most importantly, use real lime juice if possible. • Blitz the ingredients for the chicken marinade (except the sweet chilli sauce) in a blender. If you don't have one, finely chop the onion, garlic and chilli and mix with the rest of the marinade ingredients. • Pour the sauce into a ziplock bag, add the chicken and marinate for at least 2 hours but preferably overnight. • Remove the chicken and preserve the marinade. Over hot coals, sear the chicken until charred spots start to a ppea r. Now move it to the coolest part of the grid and braai slowly until the juices run clear when you prick the thickest part with a skewer. 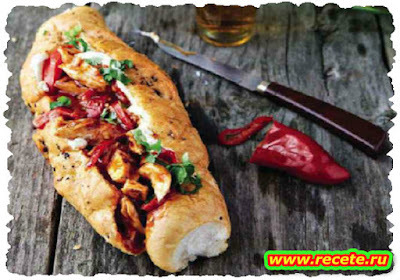 • Combine the remaining marinade with the sweet chilli sauce and baste the chicken with this while it's on the coals. A flattie or breast with bone will take about 45 minutes; deboned breast fillets will be cooked in about 10 minutes. • Rest under foil for 10 minutes before slicing. While the chicken is on the braai, heat the baguettes on the outer edges of the grid, away from direct heat. • Slice the chicken and serve with avo, jalapenos, tomato and cheddar.